I really enjoy your thoughtful reviews, Sarah. You set the bar high for well thought out critiques, and do enticing justice to the stories. Congrats to your daughter. What a lovely family photo. I had pen pals growing up (from 6th grade until I got married) so can relate how the person on the other end of the letters can impact your life. I've also recently had a developing interest in Africa so that aspect interests me as well. Congratulations on your daughter's graduation! That is a truly lovely family photograph. My nephew graduated today . . . all of a sudden, it seems like everyone's kids are moving out into the world. I haven't heard of this book -- but I do love stories (fictional or real-life) that make us aware of the rest of the world and the problems that others grapple with every day. I recently read a travelogue of Africa (Long Way Down) and the two authors both spoke about how impassioned the African children were about getting an education -- and how many difficulties they face. Yay for your daughter! That will, I'm sure, be a treasured family photo! This book sounds very appealing--it's difficult sometimes to remember that often rough days and hardships are almost meaningless when compared to those of many others. How wonderful that these two pen pals kept up their communication for so long! The tragedy of what Mugabe has done to Zimbabwe is sickening. Thank you for reviewing this book. I hadn't heard of it, but it sounds amazing and truly inspiring, especially for young readers. Excellent review! Wow. This sounds like a must-read for me. 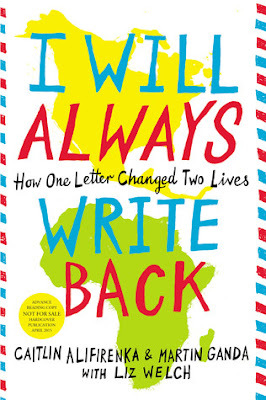 I especially love that an American kid was inspired by a Zimbabwean's quest for an education. Those who don't vote in every election should have the same experience! We take so much for granted in First World countries. Great family photo! Happy graduation to your daughter. The book's true story seems incredible and heartwarming so thanks for letting me know of this memoir. I, too, have visited Africa and am quite fascinated by the stories, people and wildlife there. Excellent review. This is a worthwhile book. Thanks for reviewing it. Congratulations to your daughter. Your dad took a lovely photo! Congratulations to your daughter - what a lovely family shot. Where is she off to next year? My son just graduated, too, from college. By the way, I'd love to learn more about your summer in Kenya. Stacy, thanks! I love your reviews too. Lucy, I’d love to hear your reaction to this memoir as a pen-pal-er yourself. ACIL, thanks for sharing my review on Google+. I confess I don’t stay on top of Google+ as I’m on 5 other social media platforms. Bee, congrats to your nephew too! Yes, books do open up eyes to the real world. Alyssa, I was impressed and touched that they are still in touch as adults and wrote this memoir together. The hardships were easier to read, knowing there was a happy ending. Thecuecard, I’d love to hear your reaction to this book. Linda, thanks! My dad encouraged my interest in photography as a kid, setting up a darkroom for me in high school. The link to your review is for a previous month. I wasn’t able to find it. 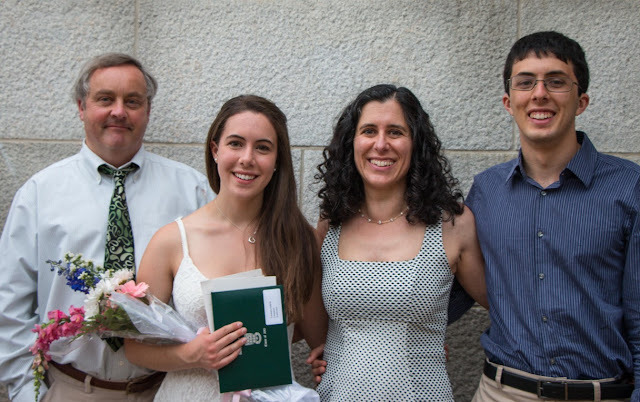 Amanda, my daughter is taking a gap term to work on organic farms abroad (WWOOF) and then will be joining her big brother at Middlebury College. Congratulations to your son! What are his plans? One of these days, probably when I write a novel set in East Africa, I’ll scan my slides from Kenya and share those adventures. It was a School For Field Studies program. Troutbirder, I thought of your multinational family when I read this book. Congrats on the high school graduation. Gotta love those! It has been a long time since I've thought of Pen Pals. I began writing to a girl my age back in the mid-1960's. My father had stayed with her grandmother during WW2. We still exchange Christmas cards and hope to meet one day. I suppose blogging is a bit like having pen pals. Such a beautiful family photo! Congrats to your daughter!! Thanks again for the review and recommendation. It was definitely worth reading. A few good books and a beach? Perfect! Thank you for yet another wonderful and thoughtful review. I'll be reading I Always Write Back beginning this afternoon! I think it'll be a great book for my teen daughter as well. I had a penpal in New Zealand for years and years. We started writing in grade 5. Congrats to Gemma! MR, thanks for sharing your pen pal story – such a cool connection! Lucy, thanks so much for coming back and sharing your reaction. I’m glad you enjoyed it too. Barrie, thank for hosting the book club! So you had a pen pal too. I never had one assigned at school, but I kept in touch with a camp friend who moved back to Japan via letters for years. Your daughter's plans sound exciting! Taking a gap year has become much more popular, and makes sense - good luck to her and congrats on her acceptance to Midd! My son was offered a job at an eating disorder clinic. With his degree in clinical psych, he has found a perfect fit, and has just finished three weeks of on the job training. He has a lot of responsibility from the get-go but he loves his job. We feel very fortunate he found work in his field, as a lot of his peers have not yet been able to.